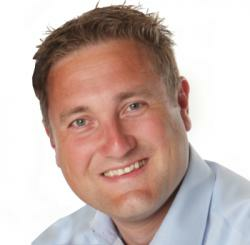 Or-mode selections in QlikView The Qlik Fix! « Hosting issues: QlikFix is back! By default, selections within a list box are done in or-mode. By selecting Customer 1 and Customer 2, we select all records that are associated with either Customer 1 or Customer 2. By contrast, selections between list boxes are always done in and-mode. Selecting Product 2 and Salesman 1 returns all records that are associated with Product 2 and Salesman 1. The question was if we could override the selection mode between list boxes. In other words, if we could return a result that showed all records associated with either Product 2 or Salesman 1. At that moment, no one could think of an easy moment to achieve this. While I had some general ideas about where to look I wasn’t able to clearly articulate those at the time. We were stumped, or at least, I was. Use the unioned Set Analysis statement in your expressions. Create an additional statement that doesn’t work on all fields in the data model, but only on those fields specified in an included fields list. This should be a relatively easy change. The current expression clears all selections except for the active field. Rewrite the expression so that it only clears selections in fields that actually have selections. Conceptually a very easy change, but might require some more tweaking to get it into the expression without errors. Performance is another important aspect. In the test I did with 10,000 row dimension tables and a 10,000,000 row fact table this solution actually performed quite well. Of course I haven’t applied this to any real world solutions, but who knows if it might prove useful in the future? You can download the example file below. In it you will find the expressions that I used, which you can copy to your own applications. Of course, if you improve the expressions then I’d like to hear from you. So what are your ideas? Is this something you should even be doing in QlikView? Is there a better way to achieve this? I’d be very interested in hearing your thoughts and feedback. Posted on October 23, 2013 by Barry Harmsen. This entry was posted in Expressions, HowTo and tagged expressions, or, setanalysis. Bookmark the permalink. Hi Barry – many thanks for the dual mentions in this post and for sharing your ideas on the topic. Many thanks to Steve and Barry for taking time to crack this. It shows again what a versatile tool Qlikview is, when backed by such masterful knowledge. Excellent solution Barry. Thanks for taking the time to work it out and post it. Glad you liked it. Out of curiosity, which ideas did you find useful? for some reason I can’t download a example file. It gives me Error (404). Can you help, please? Nice job. I tried to download example, but it didn’t work. Can you check dropbox link ? I accidentally deleted the file, it’s been restored now. Maybe thats something abit different though? This is great. Thank you for the solution. It works perfectly when I apply it to 10 fields. However, I tried to do it with a survey result where there are brand perference questions. For example, do you prefer to chocolate brand A, B or C? There are lots of questions like this that results in thousands of fields. The solution doesn’t work in this case. Do you know the maximum variables that it can take? Or is there other tweaks that I need to do to make it work? I guess there’s some limit in the length of an expression, and with this solution you’re basically generating an expression that’s longer than the combined length of the (in your case thousands of) fields you’re trying to perform an ‘OR’ on. If anyone manages to optimize Barry’s solution using this strategy I’d also be interested. I like your solution. I need to get it to work on mine. But when I put it in it doesn’t work. I put it in this way. It won’t make the vSelection. Any ideas? I am not able to download the file. It says “Web Page Not Available”. Please suggest how can I get the example file? This is a very clever solution, but I have a potential problem. The scenario is that we add a Customer 4 which is associated with a Product 4, and no other customers are associated with Product 4. When I start by filtering on Customer 1, Product 4 will be grayed out/unassociated. 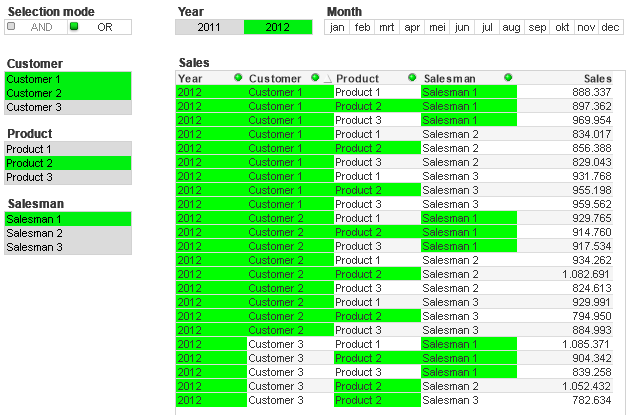 When I then select the grayed out Product 4, QlikView will force Customer 1 to unselect. It seems that this method only works when everything is associated with everything? sorry, i don’t know english..
i want this example file. Thanks for your topic! is great. But how can use in een datmodel without autogenarate. Is there a way to overrride the grey behavior of qlikview. Looks like the ‘or’ selections work but still show up grey in the example attached in this blog. Thanks for the solution. We have reached till this point in our application, however challenge is that how can we get this logic working in Section Access. Hi, I’m not able to download solution… How can I do? I can see that most of the files for your examples are not available to download from Dropbox link you have provided. Can you check this and come back to us? I am not able to download the file from dropbox. Can somebody please send me the file. What a genius idea! Unfortunately I am not able to download the file. Can you please send me the file? I am very interested in your solution to this issue, but am unable to download the example. Does anyone have this example file they can share please? Can you please upload solution again. The Dropbox file is unavailable. I am unable to download this qvw file from Dropbox. Could you please provide me an updated link?